Do you have members of your team that deserve recognition for a job well done? Would you like to acknowledge them in a way that is unique, powerful and memorable? This fun, exciting and empowering, experience is designed to expand one’s own identity and redefine one’s concept of what is possible. Participants will be filled with appreciation for their own talents and those of their teammates. 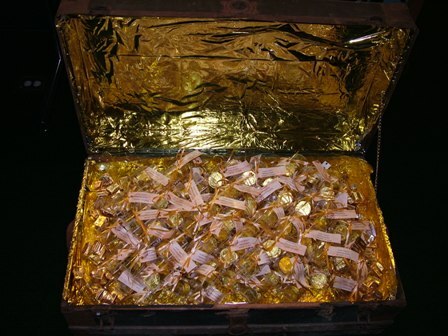 Imagine yourself on an adventure to find a real buried treasure! Using an ancient treasure map you will work together to overcome a variety of obstacles such as Blind Pirates Doom, Black Widows Death, and Shark Bite Bridge to name only a few! With each obstacle successfully overcome, you’ll receive another clue that will lead you closer to the treasure. In working together to collect and decipher all the clues, you will be lead to the spot where the treasure is buried! Within the treasure chest will be the reward you have for your team. Everyone will have the opportunity to be acknowledged for his or her own unique contribution. Ask how this program can be used as a unique employee appreciation event!